Until this past December I never liked to eat meat pies. I was at the Urban Grocer for a winter market, and we met Carey, who showed us her organic meat pies. My mom bought a couple, and we tried them for dinner. I really didn't want to. Once I tried them, I couldn't believe that I REALLY liked them! This past Friday, I went to Carey's Farm, and she taught me how to make her delicious meat pies. First, she taught me how to properly hold her Japanese knife, and chop the vegetables that go into the pies. They are all LOCAL INGREDIENTS from her organic garden. Then we put all the vegetables together in her grandmother's big pot to simmer. We even used her grandmother's wooden spoon to stir them. Then we moved on to making the dough for the pie crusts. Carey taught me a technique called cutting in. I used this to cut up the lard and butter into even pieces to add to the flour. Once we mixed up all the ingredients for the dough, Carey taught me how to knead and roll the dough. 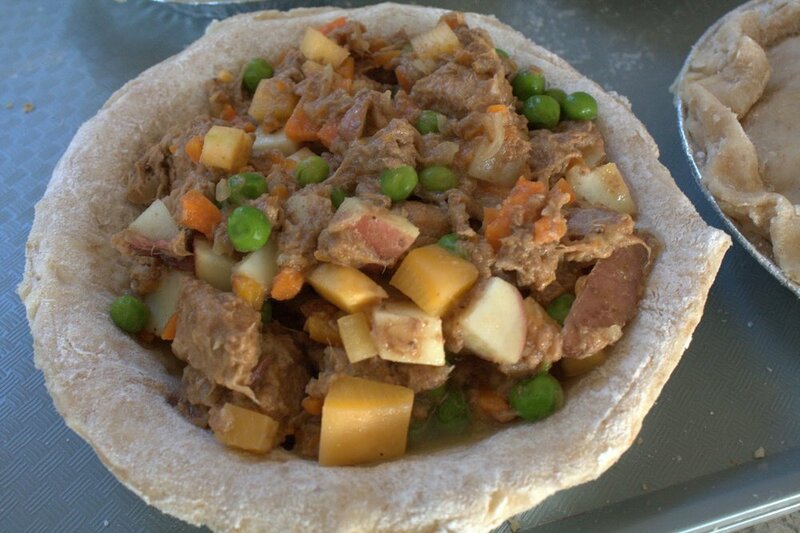 We filled the pie shells with the stewed beef (which had been cooking for 16 hours) and vegetable mixture. And then we topped them with the dough lids. We then baked them in the oven, oh yeah, they smelled so good! If you haven't already tried Carey's meat pies, you absolutely MUST!! Carey is setting up her Facebook Page for Such A Treat Meat Pies. I will add the link tomorrow.